Porcelain veneers are super thin shells of porcelain designed to cover the front surface of the teeth. They are used to recreate the look of natural teeth. These shells are bonded to the teeth to change the shape, size, and color. This makes for a perfect looking smile, and the porcelain material provides that sparkling white look that everyone strives for. Fix cosmetic dental issues: Whether you have missing teeth, gaps in your smile, or chips and discoloration, porcelain veneers have you covered, literally. These extra-thin shells can cover up almost any cosmetic issue with bright white porcelain, making your smile look as great as it should. 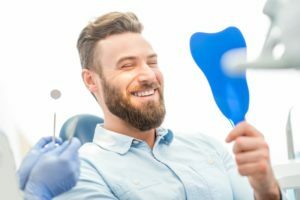 Natural look and feel: Your dentist will take impressions of your teeth, so they can make your porcelain veneers look exactly like the shape and color of your natural smile. They also feel natural—you won’t be able to tell the difference between your veneers and natural teeth. Stain resistant and durable: Porcelain veneers can withstand staining and decay even better than healthy natural teeth! You still need to care for them as you would regular teeth, but they can last up to 15 years. Invasiveness: Compared to other dental restorations like dental crowns, porcelain veneer procedures are less invasive. Your dentist won’t have to file down your teeth too much because porcelain veneers are adhered to the front surfaces. However, with a crown your teeth need to be shaved down more so it can fit over the whole tooth. Easy maintenance: The best part of this procedure is that you can treat your porcelain veneers just like natural teeth. Make sure you are brushing twice a day and flossing once a day just like you would if you didn’t have them. In addition to your normal oral health care routine, continue to see your trusted cosmetic dentist in Medfield. This easy maintenance will help keep your porcelain veneers as white and bright as they were when you first got them! Whether you want to improve the color, shape, or position of your teeth, porcelain veneers should be your number one choice. Scheduling a consultation with your local dentist to discuss porcelain veneers is your next step towards the brightest smile you’ve ever had! Dr. David Hirshfield provides top-notch dental care for the people of Medfield. Although he has been practicing dentistry for decades, he continues to educate himself making sure his patients are provided with the benefits of state-of-the-art technologies and techniques. He has completed specialty courses in cosmetic dentistry and he is ready to get you started with your very own porcelain veneers when you are! He currently practices at Hirshfield Dental Care and can be contacted by phone at (508) 359-8822.